In 2015, my franchise won the rookie-of-the-year award. In 2016, I was named franchisee of the year. Bringing a new business to B.C. The concept was so strong, I felt I could do it. I signed on in May 2014. The franchisor, which had never operated a branch in British Columbia before, identified four franchise territories in the province, based on population size. I figured if I bought all four, I could start small and then expand elsewhere. I just wanted to grab it all before someone else did! I was also only the third ShelfGenie franchisee anywhere in Canada. In that sense, it was an opportunity to be something of a pioneer. I attended the franchise system’s annual conference in Atlanta, Ga., right before my training. The franchisor’s team was very welcoming. It took all of July for me to develop my business plan, as I had to learn and hire at the same time. I started with three employees and we landed our first sale on Aug. 7, 2014. In those early days, I was with my team and away from my family a lot. 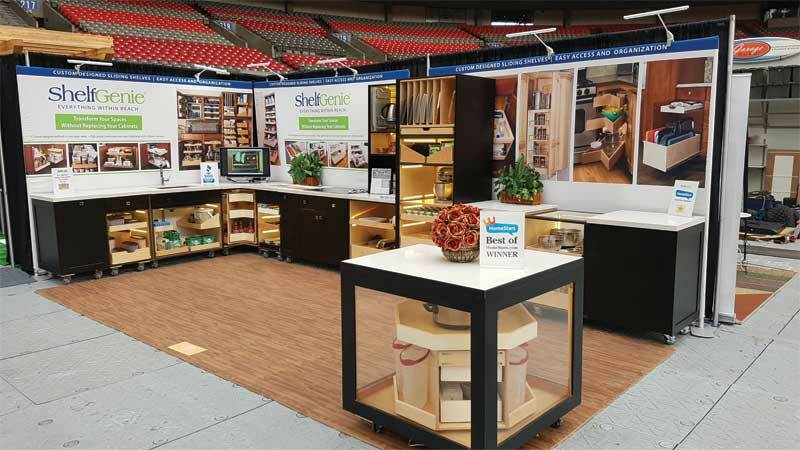 I was focusing on advertising and exhibiting at trade shows to get the word out, as ShelfGenie had no previous brand awareness in my market. My strategy was to start with the Lower Mainland. We went to home shows, retirement and baby boomer shows, women’s shows and Christmas shows, all based on the demographics of the attendees. We advertised once a week in a major newspaper, which worked well for us, too. Because ShelfGenie had no previous brand awareness in my market, I put a lot of focus on exhibiting trade shows in my early days. British Columbia’s red-hot real estate market has been a bit of a double-edged sword for us. When you have a lot of properties being bought by foreign investors, they can end up sitting vacant. Even if they get rented out, the tenants aren’t potential clients for us, as they can’t implement renovations. And of course investors who don’t live in the properties are not potential clients, as they wouldn’t directly benefit from the types of work we do. On the other hand, with a busy market, there are a lot of potential clients moving into homes that lack sufficient accessibility and efficiency. These include seniors downsizing from bigger houses into newly built condominium units. We don’t market ourselves to the homebuilders. Rather, we need the new homeowners to become frustrated first, as then we can show them the value of our product as an upgrade to their property. In other cases, seniors want to continue living in their current residence and not have to move again, but need the added accessibility we can provide. There are also attractive tax credits available for homeowners who implement the kind of renovations we offer. 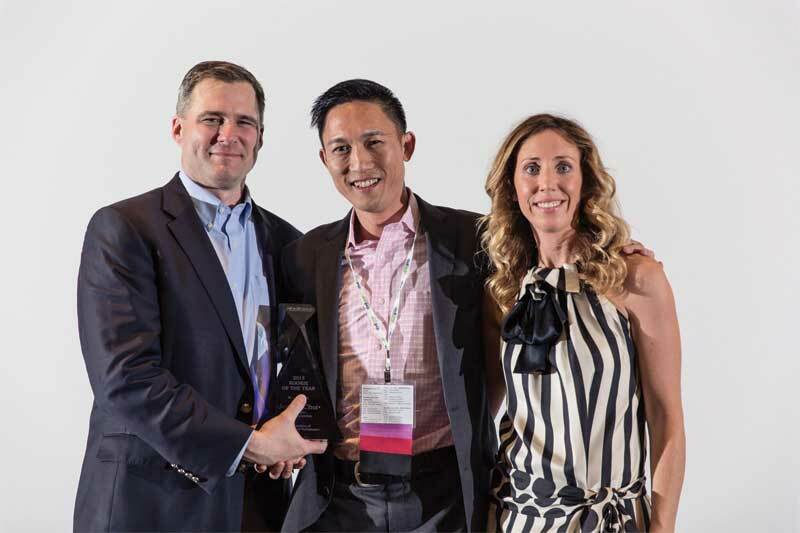 When we won the rookie-of-the-year award in 2015 at the ShelfGenie conference in Nashville, Tenn., we were the system’s first franchise ever to hit $1 million in revenue in its first year. My three main designers and I brought in 90 per cent of that business, while two other designers I’d brought on later accounted for the rest. One of my staff, Caroline Vincent, was also named 2015’s designer of the year, out of a field of more than 300 contenders. 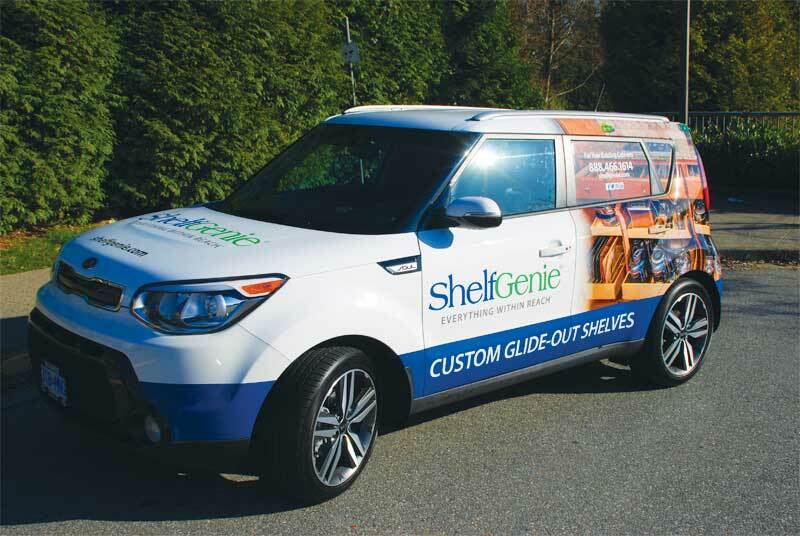 We set a few records that year, including not just the highest sales ever for a rookie, but also the second-highest monthly sales in ShelfGenie’s history and the highest customer satisfaction rating. We’re planning to get more wrapped vehicles on the road in the future. They’re like mobile billboards. In our second year, we started to service Vancouver Island, including Nanaimo and Victoria. As we became more spread out, we had to advertise in those cities’ newspapers, too, which was challenging in terms of allotting sufficient funds. So, we gradually increased our marketing spend online, including with Facebook. We also got a high rating on HomeStars, Canada’s largest online resource for connecting homeowners with professionals, which helped improve our visibility. In 2016, I was named franchisee of the year. That was the biggest compliment I could imagine. Now, new franchisees come my way and ask for the secrets to success, but I’m no messiah! It really comes down to networking, which takes a lot of hustle. I recently did a presentation for the Professional Organizers in Canada (POC), for example. And seniors are everywhere. We’ve even gone to recreational vehicle (RV) and boat shows! We look at what we do from the perspective of organization a space, not just in terms of housing.